Whether you use wild or cultivated sorrel, the plant’s pleasantly sour flavor transforms a simple sorrel soup recipe like this one into something extraordinary. 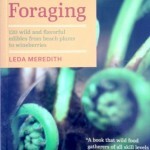 You can use wild sheep sorrel (Rumex acetosella), garden sorrel, or wood sorrel (Oxalis species). 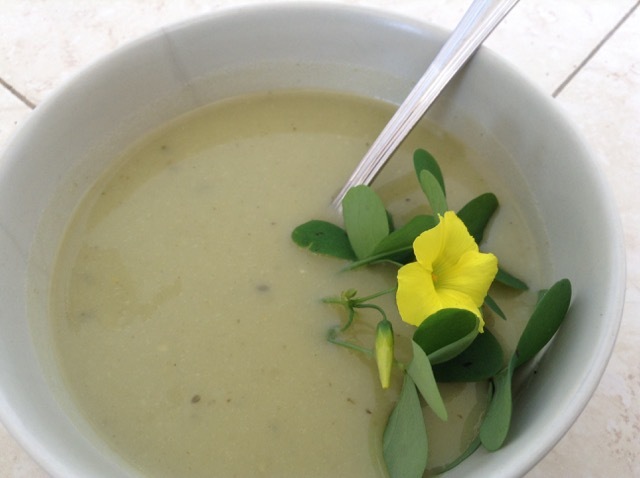 In this recipe and photo I used a wood sorrel (Oxalis pes-caprae). This recipe could not be more basic. The simple equation of green leafy veg + stock/water + Allium (in this case garlic) + oil + starch (in this case potatoes, but could be rice/barley/parsnips, etc) makes fantastic soups out of many leafy vegetabes, wild and tame. 1. Heat the oil in a pot over low heat until it starts to shimmer. Add the garlic. Cook, stirring, for 30 seconds. 2. Add the sorrel and cook, stirring, until it wilts and turns from bright green to a dull khaki color (this unfortunate color transformation is normal for Rumex and Oxalis species). 3. Add the potatoes, water, stock, salt, thyme, and pepper. Bring to a boil. Reduce the heat, cover, and simmer until the potatoes are tender enough to fall apart when you pierce them with a fork, about 20 minutes. 4. Remove from the heat and let cool for 10 minutes. 5. Blend until smooth with an immersion blender or in two batches in a stand blender. Taste and add more salt if you think it needs it. Serve hot or chilled. Croutons for crunch is a good idea. Variation: use fish stock instead of the stock and water. After blending the soup, return it to the stove over low heat and add some flaky white fish pieces or some shellfish and simmer for 5 minutes.